Mike Heck has been fly fishing the beloved Cumberland Valley streams since boyhood. Childhood fishing years would be spent on the Falling Springs, where one could get a $0.25 ice cream from Frey’s Dairy and then back to fishing. Once Mike got his PA drivers licenses it was “game on”. Days out of school would be spent on the many great spring creeks in the area. Mike was blessed to have been able to learn the art of fly fishing on some of the hardest and most famous spring creeks in the country. He has been doing so for over thirty years. Mike is a graduate of Penn State where he acquired a degree in Forestry. Mike Heck is the author of, Spring Creek Strategies and also contributed to Tying Dry Flies. He has also had articles published in Fly Fisherman, American Angler and Fish and Fly Magazine. Mike has appeared in the TV show, “Road Trip USA”, a Discovery channel show that aired across Europe. 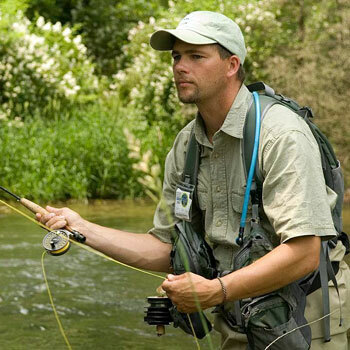 Mike operates an Orvis Endorsed professional guide service for the Falling Springs, Letort, Yellow Breeches and many other South Central PA trout streams. Mike is also an innovative fly tyer with several patterns credited to his name. These flies include his Simple Shrimp, Big Eye Rainbow, Mike’s Midges Pupa, the snowshoe emerger series of patterns and his well know baetis and sulphur nymphs. When not on the stream, Mike can be found up at his camp taking in the great outdoors. Along with fly fishing, Mike is an avid hunter of both big and small game. Mike is married to his lovely wife, Shelley, and has two children Breanne and son Fisher. You can find Mike Heck’s Trout Guides on the web at www.fallingsprings.com or contact Mike by e-mail at trout@mris.com and by calling (717) 816-7557.